… Just in time for the Holidays! Indeed, the husband-wife team behind the great L.A. Burdick chocolate creations – available till now only in New Hampshire and Massachusetts – have finally (re)opened a NYC location. As much as finally securing the new location may have been a great accomplishment for Larry and Paula Burdick, it is indeed a dream come true for the chocolate lover in me! I became addicted to L.A. Burdick chocolate when a friend brought me back from their Cambridge Mass. 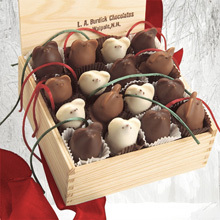 store a small cigar box filled with deliciously minute chocolate bonbons and tiny little chocolate mice with silk tails. It was a Christmas token that truly became a periodic indulgence for me. I began sending these little cigar boxes of heaven to my friends and work contacts and was so taken with their divine taste that few other chocolate companies seemed to ever compare. I was even OK with their shipping costs and being deprived the great pleasure of picking the chocolates in person at their shop. Did it all through the coolness of the internet… Worth it always, since the brilliance of Burdick chocolate lies in their petite packaging, just enough of a good thing to make you yearn for more, never making you feel guilty about the calories, yet always filling your taste buds with delight! Now, the couple have finally come home to the place where they met and started their chocolate empire. The new location is right in the heart of the Flatiron District and just steps away from the open-air green zone around Madison Square Park. 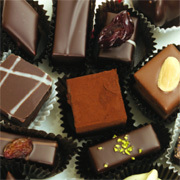 It offers their exquisite selection of chocolate confections and a small cafe where one can sit down and enjoy some tea, a snack and of course, CHOCOLATE! Do check out the discount coupons offered this Holiday Season by the Union Square Partnership, by clicking here. So have a wonderful Holiday Season, filled with love, friendship, peace and chocolate! This entry was posted on Monday, December 14th, 2009 at 4:44 pm and is filed under Chocolate Corner. OMG! I so want to go there! That chocolate sounds like heaven. Bet it tastes like that too.